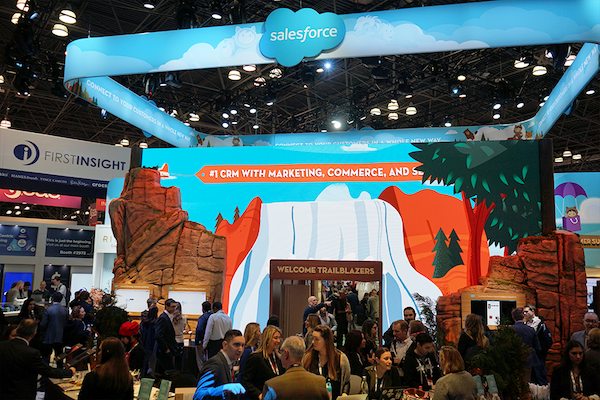 NRF - Retail's Big Show is the world's largest retail conference, a three day event in New York covering business transformation, the latest innovations, sustainability and diversity. What's notable is the continued relevancy of this conference within retail that brings people, companies and brands from all over the world together to discuss the industry. This year deep-dived into how leading brands and disruptors are redefining retail and there was frequent mention of a new acronym - WACD: "What Amazon Can't Do". Which topics dominated NRF this year? What was the general outlook? Here is my first-hand perspective from NRF 2019. One of the biggest topics in retail today reflected at NRF is the evolving role of the store. Previously considered as a piece of real estate, stores are now becoming arenas of 'retailtainment'. Despite the rapid growth of e-commerce, consumers still enjoy brick-and-mortar stores: 68% of people reference the ability to touch and feel the merchandise, and 61% reference the option to get the merchandise immediately. But an astounding 78% of millennials prefer to spend their money on a stand-out experience over product (Salesforce 2017 Connected Shopper Report). Nike House of Innovation blends online and offline beautifully, inviting customers to use their smartphone in store. For example, you can scan a code on an in-store mannequin, browse every item that the mannequin is dressed in, check to see if specific sizes are available in-store and then request for a store athlete to send the items to a fitting room. Loyal customers can also reserve items via phone and have them held in an in-store locker, ready for pickup whenever is convenient. Sephora studios: The store features tech-enabled beauty discovery like the Virtual Artist tool, which lets users virtually try on different looks, and the Color IQ feature, which scans a customer's face to find a foundation match. The location also accommodates Sephora's Beauty Studio Check-In, an online reservation tool, and its Sephora Client App, which staff can reference to quickly serve clients, including checking their loyalty status or product information, along with mobile checkout. But it's not all tech — there are also beauty classes, a concierge advice service and services like facials. Overall, customers today expect retailers to deliver fresh experiences - whether that be with new technology in-store, through enhanced service or different ways in which to order and return products. Those that master the customer experience will be the winners despite tough trading conditions. It's a well known formula that low friction and high reward is the key to a successful customer experience. As part of this, removing all friction from a cumbersome process becomes the reward for customers. To displace the lengthy visit to a suit tailor, MTailor introduced an app that allows you to measure yourself using your phone's camera for men’s custom clothing (shirts, suits and jeans). To tackle the costly returns, Nordstrom have 24 hour automated self-service kiosks for returns. To cut long waiting times queuing for the till, Fairway's grocery stores are enabled with cashier-less checkout using your mobile phone. Experience is important, but becoming frictionless is key. A great starting point for this would be to identify pain points by speaking to your disloyal customers. In fact, it looks like this exercise should be done earlier than later now that we are seeing China ramp up its development on cashless payment methods and closer to home, Amazon soon introducing zero-click checkout. “The A-effect” refers to Amazon and Alibaba - two industry giants shaking up the retail industry. Amazon needs no explanation, but the other 'A' brand that should not be neglected is Chinese e-commerce giant Alibaba, who have built their own impressive digital shopping ecosystem. Partnering: We are seeing retailers openly sharing data and launching new services - for example, smart grocery stores. Convergence: In his keynote speech on the second day, Scott predicted that brands will work together to counter Amazon and voice technology - e.g. by offering brand bundle offerings. For example, one possibility could be for an athletic apparel retailer, a gym, and a health food chain offering a joint subscription model. Copy: Retailers are developing their own recurring revenue models. Collaborate: Some retailers have chosen the route of “if you can't beat them, join them”. This includes Kohl’s, who have given Amazon dedicated shop space within its own stores. Regardless of which tactic is adopted, what's clear is retailers need to take action and blur the old barriers of competition to address new threats in their market. Doing good in a number of ways is becoming more and more important to consumers. Ignoring this, or paying lip service, will no longer cut it. Consumers are increasingly demanding responsible business and responsible brands. They want to feel part of a community and are looking to engage with authentic brands that relate to their core values. For this reason, purpose was a big topic at NRF, with multiple CEO's addressing the topic and seeing this as a clear differentiator to their brands because "Amazon is not the place to create deep connections". One such purpose-driven brand is Everlane, a retailer that practices Radical Transparency by giving consumers the insight into their supply chain and the full cost breakdown behind products - so that you know exactly how costs have come together to put a price on a tag, and what processes were undertaken to put a t-shirt on a hanger. This is being recognised as a powerful brand differentiator, and translates into real ROI. The reimagined storefront, striving for a frictionless shopping journey, adapting to new competitive pressures, and a keen focus on brand purpose - These four big themes of NRF demonstrate the changing state of retail worldwide and what we can expect to see more of this year. What's clear from all this is that retail brands will need to get creative and take more calculated risks to stand out against the heightened competitive backdrop. Retailers can no longer stay comfortable in how they have traditionally found success, but must push themselves to innovate at the pace of the customer and a market that's moving faster than ever before. Visit our Unified Retail resource hub for more of the latest insights and get access to our 2018 Holiday Shopping Report.